The ultimate goal of optimization is for your reader, your potential customer to do more: stay on your site longer, read more, and hopefully wind up making a purchase. A simple way you can improve your small business in these categories is to optimize your website for multiple SEO keywords. Investing your time to research the ideal keywords, a perfect title, meaningful content, and a clickable description will all contribute to achieving the most promoted website, improve your small business and your ROI. You can use Google Keywords tool or Wordstream or even just a standard Google search query during your research. There’s also paid keyword tool like Jaaxy to help find the best phrases for your business. Try searching one of the phrases in Google to see what suggested topics pop up as well. 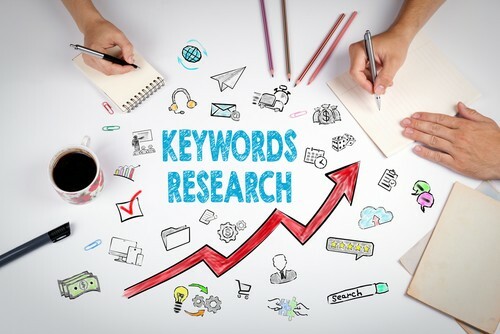 After you compile your keywords, there are only a few more steps to make sure your website is optimized professionally to attract the highest amount of users. Always focus on what your website is aiming to offer, and use the phrases you come up with to help direct users to your website’s specific strengths. Website’s that are frustrating for users will make them want to leave quickly. Never use tactics or keywords that confuse or mislead your audience. They came to your site to find something very specific so make it simple for them. Your website offers something unique, and you want these keywords to represent the distinct identity of your website in an authentic manner. It’s important to hook your audience into wanting to learn more about your services or products. If your readers are intrigued they will continue to search further or even save it in their queue for later. In order to lure the reader into learning more about your business and content, you will need an optimized title that grabs their interest. You can and should fit your phrases in each title for your website. Multi-keyword targeting needs to be well intended in the title to keep the reader on the page long enough for them to read below or interact with the other pages. Your website tags and suggested pages should also include your specific SEO keywords in the title. Believe it or not it’s easy to over-optimize. Be careful or else your website will earn a very low click rate. Your title should sound intelligent, yet informative in order to latch on to a user’s intent. It should be simple and direct, yet interesting and persuasive. Search engine optimization in today’s age is heavy on meaning, instead of crafty insertion of one or two words repetitively. Google is so intelligent now that the intent of the searcher is much more important, especially for local, small businesses. Your content must be well thought out, unique, and thorough. There is one key meaning, for example (catering) but there are so many possible key phrases the user could be typing into the search bar to find you. By writing content that matters, you will end up ranking for multiple different keywords without even meaning to. You will optimize your entire website for multiple SEO keywords just by fulfilling the user’s question or curiosity by writing intriguing content that is not filler or affiliate marketing garbage. Relevancy is everything, and Google will put more weight on this content over others. Multi keyword targeting works well if the user has a clear description of the website page. If the homepage of your dog training website pops up, it should include your SEO keywords right below the link in short, revealing description. Although keyword repetition is useless in content, it works when it comes to the title and description of the link. The description only needs to be 1-2 sentences and should give away all the main points in the content, and should also overlap with all phrases chosen. The searcher’s intent should overlap with the both the title and description. The description of your website is your second chance to fully hook the reader’s click and purchase. A well-crafted title is essential to encourage people to visit your website, but your website’s description might just be the cherry on top that convinces readers you have what they need. Once you have completed each step, try these SEO words for a week to see if they are increasing your statistics. If not, simply change one or add one to see if it makes a difference. Once you hit the sweet spot, you will be proud of your profits and your business. Increased funding also means access to more SEO professionals who could make your website legendary. SEO is never perfect the first time; every business owner must go through this process at multiple stages to keep up with the new times and to develop the perfectly optimized website for multiple keywords. Do your best to contribute vital content for valued customers in the future and Google will take note of your website’s worth. Contact the experts at Bullseye for all your marketing needs! Call us today at 561-469-8640.